Home / Blog / [BAW 30] GIVEAWAY!! 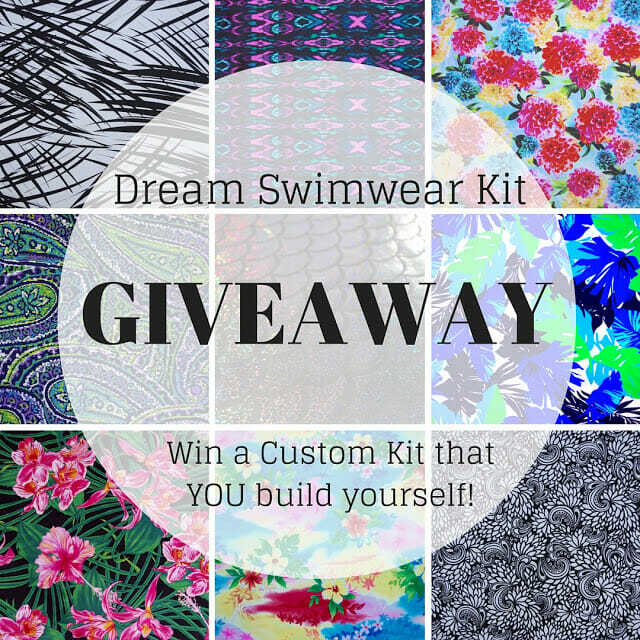 Win a Custom Swimwear Kit!! This week I’m mixing it up and having a GIVEAWAY!! YAY Don’t you love that extra Sunday in July! Now for the giveaway! !- I was thinking about which fabric and kit I should pick to give away and then I realized that I wanted to hear more about your dream swimsuit and swimwear kits! And I want you to be able to pick out the perfect kit for you!! First you can pick one of my ‘Basics Kits’: which is the series I designed to make swimwear sewing easier- they include everything you need for different types of swimwear! 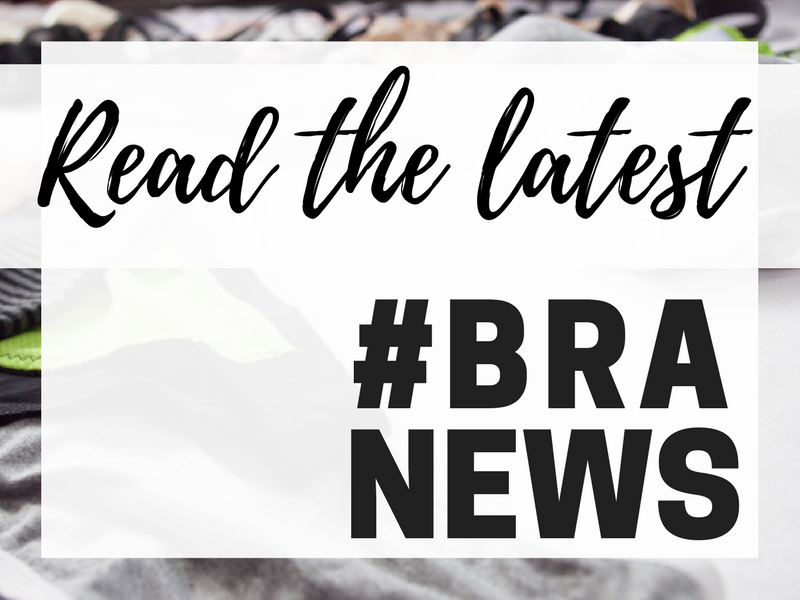 All of your lining, elastic, G-hooks, and bra stuff for bra-swimsuits! To see exactly what amounts are in each of these basics kits- make sure to go and check them out in their full listings on Etsy! Then you pick the fabric that you want to go with your kit! You can pick up to 1 meter of fabric, either 1 solid meter, or 1/2 a meter each of two coordinating fabrics! And I’ve just replenished my shop with some gorgeous options! These are just some of your options! Make sure to head over to my Etsy Shop to see all your options!! As usual, you can be anyone from anywhere to enter the giveaway! You have until next Saturday at noon EST to enter, and I will be announcing the winner at the start of the Round-Up post next week! I can’t wait to hear all your favourites and thoughts for swimwear- it’s my fav! I'd make a tank top with bra, and shorts bottom for extra coverage of those untidy areas. ooooooh this is such a gorgeous giveaway! I would take the Bra Swimsuit kit, I'm so desperate for a new set… I can never find anything that matches. Either the top doesn't fit/ no support or the bottoms are too tight or give an unflattering shape. For the fabrics I'd choose the mermaid print for the top (can't resist that glittery shimmery goodness <3 😀 ) and plain black for the bottom so it's a bit more versatile, although I'd totally rock the whole mermaid look. Bra Swimsuit Basic kit with Light Pink to Purple Ombre Swimwear Fabric. I am in dire need of a swim suit and the ones in the stores – if I can even find any now – are super expensive. I am disabled and need to go to the YMCA pool for therapy so I need a suit. If I don't win, and I am not the lucky type who would, I think I may just have to purchase what I need to make my suit. Oh my heavens, dream come true — I would definitely try out making a Sophie swimsuit with the underwire kit and the black and white flourish print! So awesome! So fun! This would be a great push to get me to try sewing swimwear! I've been eyeing the Sophie swimsuits, so I'd do the ultimate kit and make a 2 piece foam cup suit in the blue green leaf print! The kits are such a great idea!! I would do the one piece kit with the pink to purple ombre! It is soooo unique! But that was a hard choice because I liked a LOT of your fabric!!! I would make a tankini. And I LOVED the one you made your mom. So I would probably go that route – possibly putting a little bit of opening in the back of the skirt part of the top…. 🙂 just to be unique. I have never ever made a swimsuit or underwear and would love a kit to get me started. The bra swimsuit kit would be perfect and won't the holographic mermaid be perfect for a swimsuit?!! I'd love to draft a swimsuit covering my thighs in a mermaidesque way..
What a great giveaway! If I was lucky enough to win, I would choose the ultimate kit with the light pink to purple ombre swimwear fabric, to make a tankini and bottoms. monicanugent3 at gmail dot com. 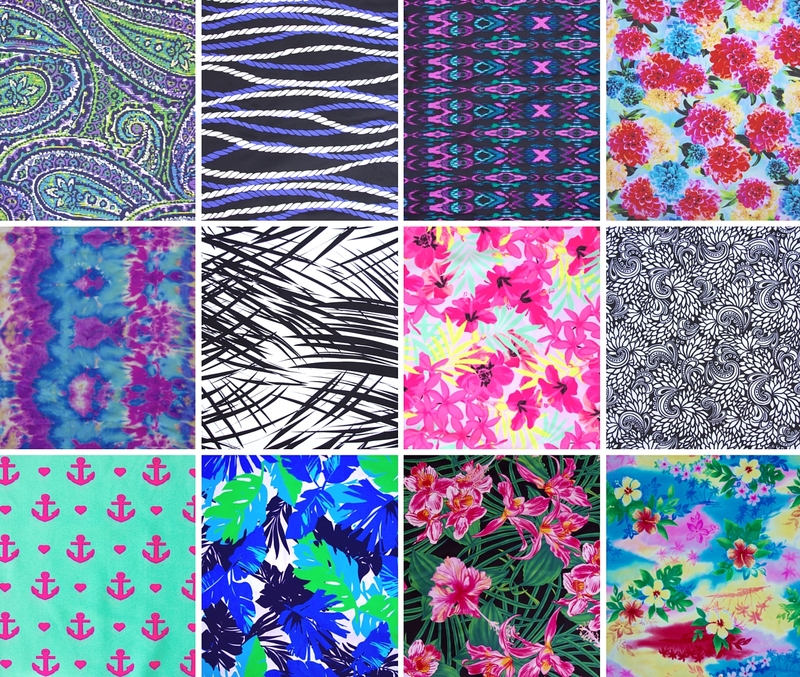 i would go with the anchor print fabric because it is fun and I don't carry floral prints very well. Thanks so much for running this giveaway! I would pick the two-piece kit with the ombre pink and purple fabric and the holographic mermaid spandex to make an awesome mermaid suit for the beach. Love your shop! I'd use the ultimate with the black and white fabric to make a old kwik sew pattern that I love. I would use the black flourish print, with accents and bottoms in solid black, and the bra/ultimate kit to make a bikini. Maybe a boned tankini top with corset lacing, or maybe I would experiment with wide vintagey halter straps? I just made my first swimsuit from my self-drafted bra pattern, and I'm already hooked with the design possibilities! I'd chose the blue and green leaf print and solid back fabric, and the Ultimate kit. I'm about to make my first bra and when I figure out my sizing I'd make the CCF Sophie one piece. I would use your Ultimate kit and make the Sophie Swimsuit by Closet Case Files. I'd make a two piece, with the holographic mermaid print on the bottom and that adorable anchors print for the top. Given how little fabric swimsuits take, I'm sure I'd be able to squeak out a matching suit for my little girl too. I would pick the ultimate kit. I love the support a full bra gives to a one piece. I would use the blue/black/white flowerprint since I love florals! The patterns I have made once before is the Bravo Swim #1 pattern by Bravo Bella. I find that a princess seam one piece looks best on me. I follow your blog and admire your work! You are very creative, talented, and hard working designer! Thank you for the blog and all your tips and tutorials. I'd choose the bra swimsuit in your neon floral! I have a RTW swimsuit unpicked and ready to knock off:) thanks for the giveaway! Ultimate basic kit, green/blue paisley print (my favorite print of all time)and make a retro swimsuit with gathers along the sides to help hide the rolls! I would pick the Ultimate Basics kit (even though I already bought it on Friday!) pair it with a meter of the purple Paisley Mosaic (to match my hair), and then I would probably marry several patterns to make myself a tankini. Hello Erin, you are very generous. I like the idea of a one piece bathing suit with the blue with pink and white flower pattern material (the last one) thank you for the chance! I'm another Canadian happy that you are supplying fabric and notions online. With the Canadian dollar so low and the lack of local options it's great to have another choice. I would buy the bra basics kit with the neon coral swimsuit fabric and I'd make a bikini with a boylston top and high waisted bottoms. I would definitely pair neon coral swimsuit fabric with a bra swimsuit! Thank you for such a nice giveaway! I debated your pink/purple ombre print, but I think I would have to go for half the mermaid scales and half the basic black. I would chose the Ultimate kit and use my bra pattern to make a one piece suit. Thanks! I *think* you can email me through the account that I'm posting as. I love you shop and look forward to your blog posts every week. I would pick the two piece basics set. I'm easing my way into underwear-making and am just not quite ready for underwires yet. 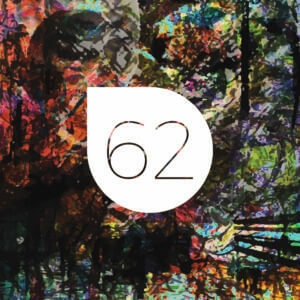 Soon though! I love the holographic mermaid print in your shop, but I think the black and white flourish print is the winner. Graphic yet subtle. So happy about this giveaway! I'm working on my own swimsuit pattern and I would probably make it a highwaisted bottom and a (longline) bra top! I would choose the ultimate bra swimsuit set and black and white flourish fabric + fuchsia geometric print! You can contact me at yerlau (at) hotmail (dot) com. Thanks for your nice giveaway! Awesome giveaway!! I really want to make my own bathing suit, and haven't got there yet…I would have to pick the Ultimate basics set, and the neon coral fabric! I would make a two piece suit with high waisted bottoms, with possibly some ruching along the sides. Oooh thanks for the giveaway! I'd pick the bra swimsuit kit and pair it with 1/2 meter of the periwinkle bird fabric and 1 metre of the black fabric. I'd make a two-piece colour blocked suit with high-waisted bottoms and a bra top. Ultimate kit, tropical pink floral fabric( which I had already been eyeing up in your store) Sophie suit. Great giveaway to help expand my sewing horizons! Wow! This is a kinda fantastic giveaway! I've been wanting to sew my own swim suit really bad, but haven't worked up the nerve yet. I would pick the Ultimate Basics set with the pink gingham swimsuit fabric. I love gingham! I would attempt to make either the Closet Case Files Sophie swimsuit, or Gertie's Butterick swimsuit pattern. Thank you for offering this giveaway Erin! The Light Pink to Purple Ombre Swimwear Fabric would make the perfect two piece suite with boy short style bottoms! What a lovely giveaway! I'd go with the bra swimsuit kit, the tropical pink floral fabric, to make a Closet Case Sophie swimsuit! I would choose the ultimate bra swimsuit kit and make a tankini. I like the periwinkle blackbird fabric. I would LOVE to win the ultimate kit with foam to make the perfect length one-piece suit that doesn't give me a wedgie for once!! 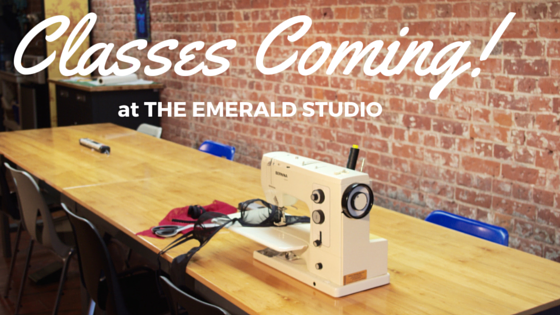 It's been a dream of mine:) I also have my eye on the classic black and white fabric….. 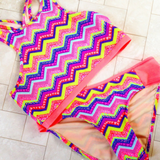 I would love to make a tankini set. I like the ultimate Bra Swimsuit kit. Colors that I love the Periwinkle Blackbird fabric! Thanks foe the giveaway. The ultimate kit for a bra cup swimsuit with the mermaid fabric for one really cool swimsuit. For an old chick. My favorite is the Ultimate kit and the Periwinkle Black Bird pattern. I would love to use them with a Sophie One Piece swimsuit. Love your blog, and thank you for sharing your bra making knowledge. Bright Blooms! I would make a Jalie Tankini. ohhh I'd have to go for the Ultimate kit as these girls need all the support they can get :D. I'd probably make a tankini. for fabric I'm thinking nautical rope for the center panel, and the black for the color blocked sides. Lovely selection….I love your blog. Oooo! I would love the basics kit for a one-piece suit and the Turquoise & Pink Anchor Nautical Swimwear Fabric! (You are correct. It is super fun and cute!) I would make the Maison Fleur 8101 Halter Neck suit. Decisions! Decisions! I'll go for your "Bra Swimsuit Kit" and "Super Chic Blue & Purples" fabric. I'll keep it totally Canadian eh and make a "Closet Case Pattern Sophie Swimsuit!" Thanks for the fantastic giveaway Erin! I would use the ultimate kit to make a one piece, bra supported swim suit in the green and pink floral fabric. then, maybe I could win a cruise to wear it! A girl can dream even if she can no longer wear a bikini! Such a hard choice, but I think I'd choose the Ultimate basic kit for the swimsuit bra and the purple and blue tropical (or maybe the Kaleidoscope…). I really want to make either the Closet Case Files Sophie or Bombshell or Laela Jeyne's Lola Swimsuit this summer! The ultimate one piece bra kit since I need support for the giant jello melons. For the outer, I like the Hawaiian dream. It has a lot of my favorite colors. I would do the one piece, with the Paisley Mosaic fabric. I would make this suit to wear in my water aerobics class. I will pick a size smaller than I am right now in order to reward myself for my first loss of 25 pounds. I am a pear shape, and I need to lose weight so that I can have surgery to get out of a wheelchair. And what a gift! Purples, Paisleys, and I did it myself! Oh my gosh! Love! I would go for the bra kit. I need the support! I'd make a high-waisted bikini, and the super chic blues and purples is to die for! You have a great selection! Ooh! The ultimate kit and the periwinkle black bird! I'm partial to a tankini with shorts. I would order the Ultimate kit in the green/blue feathers material. What a beautiful fabric, lovely colours. Some day I would love to have a swimsuit that fits. I must learn how to make one. Wow! I'd love the foam cup or the two piece kit with the two black and white prints or the the nautical rope and purple and blue tropical prints. I'd probably use the Ohhh Lulu Cindy pattern or draft my own. I'd have to find a pattern for a suit with a bit of a skirt but it would be lovely to finally have straps that stay put on my narrow, sloping shoulders! I'm excited to learn to make bras & swimsuits that will really fit me. Even if I have to purchase additional fabric your Bra Swimsuit (Ultimate) kit with Super Chic Blues & Purples fabric would be an excellent starting point! graycm@bellsouth.net – thanks for the opportunity. I would love the bra kit and first row #3. I want to make a swimsuit that fits, I'm a big girl and have a hard time getting a good fit for large bust and small bottom. Plus I want to make bras and underwear in color and print. Big girls like more than black, white and beige. I want to make custom bras for full size women with out it costing $100 just because you don't fit the average size. I'm small in the band 36, 38, but large cup h,j hard to find and sales people try to give you something that is almost the same. Not true, I can't wear a 40 band I fall out the bottom or a 4d cup. And so many speciality stores are closing so hair to find my size. So I really need to learn how to make what I need. Of course I mean the ultimate kit – was getting too excited at the thought! The ultimate kit with the turquoise with pink anchors. Thanks for a chance to win!! Oooh…awesome! I'd go for the Ultimate kit and probably the pink/turquoise anchors. I say probably, because the paisley mosaic is so pretty too! What a great giveaway, thanks Erin! A basic two-piece in tie-dye would be my choice. Thank you for hosting such a generous giveaway. I'd choose the itty bitty bikini kit with the Classic Black and White printed swimwear fabric to make a classy black and white string bikini. Love the idea of planning what you might win…..sooooo, the one piece kit with the bra wires and the paisley mosaic would be lovely. I have made a Bombshell suit before and would give it another go with wires this time". laurafaun@gmail.com. Thanks so very much. One piece kit+holographic mermaid=awesome monokini!!!! Two piece swim suit because I love tankinis and I love all the florals. I'm not sure which one I'd pick yet but love the choices! I like the idea of the Ultimate Kit, as I am never able to find an underwire bra swim suit top in my size! I would chose the black and neon coral solids to color block a suit with a retro bottom. I have favorited your shop so that I can sew a suit for next summer, when I am no longer pregnant. Thanks for giveaway! Awesome, already following you! I'd go for the bra kit with the resort chic black and white fabric. Maybe try out the new Sophie pattern from Closet Case Files. The ultimate kit with the new black and white flourish print. Hard to pick as you have so many beautiful prints available now! I really want to try the Ohhh Lulu Abigail suit modified to have an underwired bra built in for additional support. I'm excited to sew a one piece suit since RTW ones never fit me. Nice giveaway! I'd pick the ultimate system, Periwinkle Blackbird and make a Lisette B6360, the twist front tankini, with the fitting advice of Mrs. Weaver's Finest Unmentionables. I have been eying your swimwear fabric for a while! I would use the one piece kit and the blue and green leaf print to make a Nautilus swimsuit. I tested that pattern last summer and love the design, but the torso is about an inch to short on me. I have been meaning to make another, and it would be lovely in that print! My email is kwmucha at gmail dot com. Thanks for the opportunity! What an amazing giveaway! I'd love the ultimate kit with the holographic mermaid fabric, and plain black fabric. And to try to make the new closet case files high waisted Sophie bikini and lose my swimsuit making virginity! I love that you are a Canadian sewist and making fabrics and findings available online. I have been following your blog from the beginning and find it inspirational. I would use the ultimate kit in order to create a lot of support. I would use it with nautical rope. I would create a swim/bra top, and then use remnants of the fabric as trim on matching swim short bottoms and also a long-sleeve rashguard. This 3 piece mix and match swim wardrobe would then be perfect for a day of paddling, hanging at the lake, swimming with my kids. I would get the one piece with the pink to purple ombre. The ultimate kit (excited for support in a suit),with the anchors and the p4p suit, with the one piece hack. So gorgeous to match your beautiful fabrics! Oooohh Erin! This is such an amazing giveaway! I'd like ultimate kit and it's a toss up between the holographic mermaid and the chic blues and purple. Those are my top 2 from your options. I really want to make the new Closet Case Files Sophie swimsuit, but Patterns for Pirates Siren/ sailor one piece hack or Seamstress Erin's Nautilus Swimsuit are also on my wishlist. The ultimate kit with either the kaleidoscope or tropical pink. 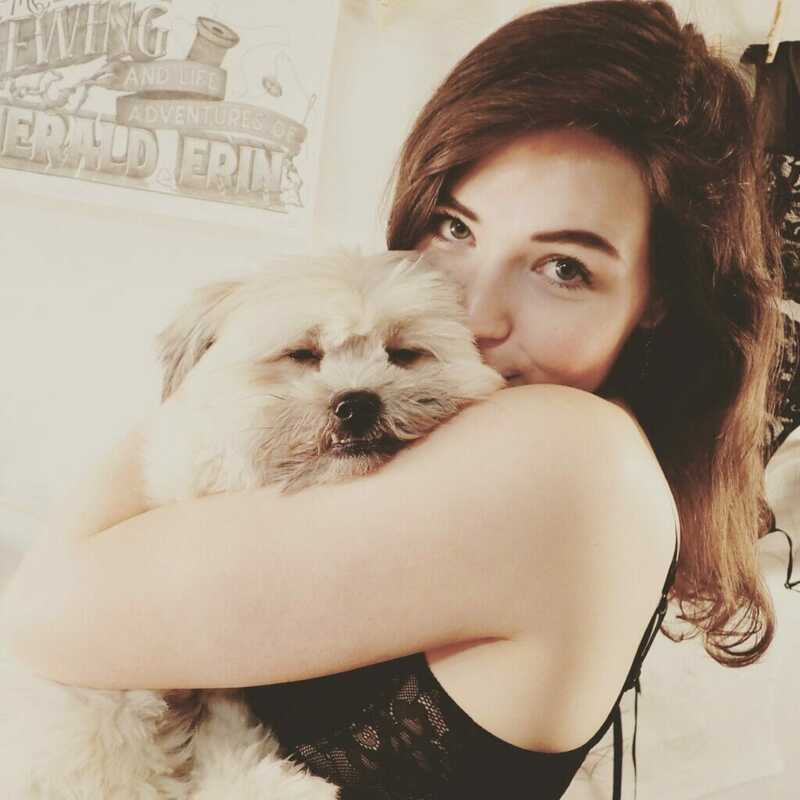 I'd make the new Closet Case Files Sophie. One peice since I use my suits as workout clothes and bikinis don't always hold up through that! I love the fun blue and black flowers fabric!